Before we decide how to measure, we must decide what matters most. 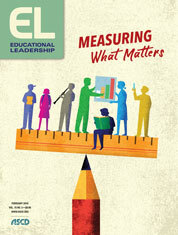 The idea of measuring what matters most in school seems important to me. It makes me excited about what classrooms and schools could be, and sad because they too often aren't. Right now, what we measure, over and over and over—with little regard to the damage the measuring (and the long process leading up to the measuring) may do to young people and their teachers—is the capacity to attend to, store, retrieve, and repeat bits of information and skills too often devoid of meaning. Those measurement decisions didn't emanate from thoughtful dialogue about what matters most in the development of young humans. Rather, we believed, or were somehow convinced, that the capacity of youth to absorb, retain, and release information on command was the best thing schools could contribute to the present and future welfare of the young. I am not a believer! So, before we decide how to measure "what matters," I'd propose that we have skipped two crucial steps that come before that. First, we need to think deeply about what it is that really does matter most in learning. Second, let's consider how we ensure our readiness to commend, model, and nurture those attributes. My short list of attributes to which schools should attend most vigorously is not very short. Some attributes reside in the cognitive domain, some in the affective. Most live in both spaces. Here are a few candidates I'd offer for discussion about what matters most. I'd like to see our students engage deeply with ideas; grow in their appreciation for the power of the human mind; value the humanity in all people with whom they share space on this planet; give rise to a dream and know how to nurture that dream wisely; see responsibility as a means of improving the world around them; seek and appreciate beauty; listen to understand and to learn; and practice caring, empathy, kindness, and generosity. I'd want them to come to know the difference between a right and what's right. I'd like to see them develop a growing sense of self-efficacy and a healthy dose of humility. I think it's important for learners to see knowledge as the story of all the people who came before them, and to find knowledge in their own story. I hope they would come to see themselves as innovators, problem solvers, and people who can contribute to untying the Gordian knots that surround them. There are many other possibilities, of course. The point is that well before we engage deeply in deciding how to measure "what matters," we should be as confident as it is possible to be in a complex world about what matters most in helping young people become their best selves. We ought not to be measuring attributes that we aren't teaching, modeling, and tending to, and certainly not if those measurements might weigh negatively on our students. Before we discuss how to measure what we value, we need conversations about how to support what we value. We have two key levers for supporting the development of what matters most to us. One of those levers is what and how we teach. The other is how we are together. We'd need to change both what and how we teach, and how we function as a community, before we could mentor young learners in developing most of the attributes on my list. In regard to what and how we teach, we'd need a transformation of how we understand the concept of curriculum. We are not currently geared, for example, to teach the disciplines as the story of the people who came before us and to prepare students to tell their own stories. We haven't had much practice in helping students explore the joy that learning can evoke, what it means to be deeply engaged with ideas, or how to test our skills in seeking solutions to problems that matter in the world. Before we can help young people develop the skills of critical thinking, problem solving, and originality, we need to shift our primary focus from covering data and rehearsing skills to envisioning curriculum as making meaning of the disciplines. We need to see teaching and learning as raising windows on the world in which our students live. Before we consider measuring student engagement, we should ensure that what we teach is engaging. Even before we set out to value attributes like grit and persistence that many consider to be "what matters most," we need to understand that persistence in service of work that lacks meaning and that grit in service of someone else's vision are difficult to commend to the young, and thus likely lack staying power for them. Likewise, how we are in our classrooms requires an overhaul before we measure even basic attributes like collaboration and willingness to entertain multiple perspectives. Before we can support our students in developing their own voices, we have to make time and opportunity to give them a voice in determining what we do and how we do it. Before we even consider measuring attributes like respect, empathy, and regard for the contributions of other people to our own development, we have to work with our students to create multifaceted learning scenarios that are complex enough to require those sorts of traits for success. We can grow in these kinds of directions ourselves, of course, just as we can guide our students' growth. But we're not now where we need to be to contribute either the skill or will necessary for the journeys. So, first, what do we really believe matters most to the welfare of our students—then, how will we chart a course in that direction? Only then is the question of measurement really warranted. At that point, we'd likely find our more habitual measures are ill-suited to providing the insights we and our students need to understand how well we're doing in supporting what matters most. More promising ways of thinking always require more promising measures, and they're available to us, just as richer ways of conceiving teaching, learning, and being are available if we reach for them. Carol Ann Tomlinson is William Clay Parrish Jr. Professor and Chair of Educational Leadership, Foundation, and Policy at the Curry School of Education, University of Virginia in Charlottesville. She is the author of The Differentiated Classroom: Responding to the Needs of All Learners (2nd ed., ASCD, 2014) and, with Michael Murphy, Leading for Differentiation: Growing Teachers Who Grow Kids (ASCD, 2015).